Whether you need surgery as a patient, or if you are designing a health plan for an employer group, it can be a challenge to understand the differences between providers in your area. MPIRICA Health Analytics wants to make that easier. The MPIRICA Quality Score is an intuitive, scientifically valid way to compare the past performance of surgical providers in every region of America. Informed by reliable data, and backed up with a rigorous methodology, The Quality Score rates surgeons and hospitals by what matters most: their results. It incorporates measures like risk-adjusted complications, mortality and readmission rates over a 90-day period to assign providers a score between 100 and 800 – similar to a credit score. See our Frequently Asked Questions for answers to questions about how The MPIRICA Quality Score works. How successful has my hospital or physician been in performing the procedure I need? The question is not easy to answer because medical data is not available in an easy to understand format, and determining whether a good outcome occurred is surprisingly complex. To add to the complexity, individual patient health prior to treatment is a major factor influencing treatment success or “a good outcome” so a good doctor with a lot of very sick patients may have worse complication rates than a bad doctor with a lot of very healthy patients. To solve the medical quality complexity, MPIRICA is providing a way for people to evaluate their hospital and physician choices based on objective outcomes, instead of subjective reviews. By partnering with experts in medical data analysis, we take years of data reported by hospitals and apply a statistical methodology that has been used in numerous studies involving millions of patients. 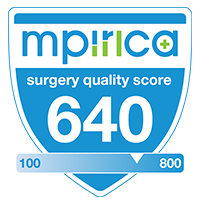 The result is the MPIRICA Quality Score, a trustworthy, easy to understand number, much like a credit score, that gives users a clear view of hospital or physician quality for a given procedure. In its simplest form, the MPIRICA Quality Score compares the performance of each hospital and physician to "expected performance." For every procedure we score, MPIRICA use actual results reported by a hospital and compare it against expected results generated by a model built using national data. Specifically, the different levels of patient health are first accounted for so that a hospital or physician are not penalized for taking care of more difficult patients. Then years of hospital and physician outcomes are analyzed to identify the hospitals and physicians that consistently perform better or worse than expected. MPIRICA Quality Scores are produced only if there is enough information about a hospital or physician to clearly identify differences in performance. MPIRICA’s approach is unique in that its score is determined based on holistic performance over the full continuum of care from admission to 90 days after discharge. In this way, The MPIRICA Quality Score compares performance across the measures while safeguarding against situations where hospitals and physicians show good performance on a single outcome measure at the expense of another. See our methodology page for more information.